Everyone has heard the concept of “hitting the ball down a set of railroad tracks,” while learning the game of golf. It is an interesting visual, but sometimes having something concrete to work with helps integrate this thought much more efficiently. The “railroad” logic is designed to get golfers thinking about their alignment, hoping to instill proper fundamentals. Fundamentals are key and one of the basic fundamentals in the golf is the setup. The boys from Swing Setup have your solution to anything regarding the setup. Often on driving ranges, we see setups (like the one above) to help golfers work on consistent ball position within their alignment work. Club heads, grips, sand, dirt and moisture don’t mix well. Also, it’s difficult to gain continuity with this method of lying slubs. There has to be an easier way! Check out how Swing Setup does things…. As Eric Heddleston touches on in the interview, this product helps with alignment not only on straight shots, but it is built to help golfers begin hitting fades and draws. By adjusting alignment, golfers can make hitting a variety of shots that much easier! Now this product isn’t used exclusively for hitting shots on the range. It is a multi-facet tool, one which can also be used around the greens as well as during putting sessions. 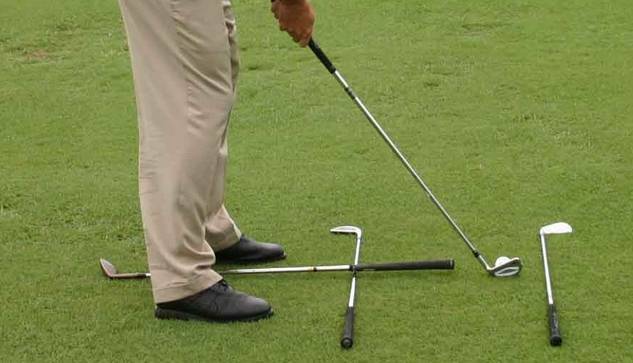 We all know how poor putting alignment can effect our chances of making putts. Master the fundamentals and align your golf game. Next post: Bridging the Learning Gap: The HEAD Coach Sees Something Missing from the 2014 PGA Show….